The 2015 World Series of Poker is about to get underway and like every year, would-be poker pros have their eyes on the Main Event prize, not to mention the multi-million dollar scores waiting in dozens of poker tournaments. Whether you play online poker or are choosing to take a seat in the WSOP without having ever played a virtual card before online, you’re going to be a part of something special. 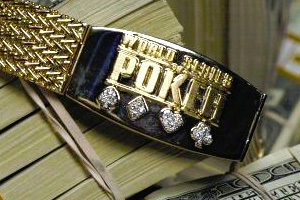 Today, we’re taking a look at the big winners of previous World Series of Poker. Martin Jacobson is famous for having won the second biggest Main Event prize in WSOP history at $10 million. While the poker tournament field he conquered wasn’t the largest of all time, it was the first time that the World Series of Poker organizers guaranteed $10 million for first place. To put things in perspective, Jonathan Duhamel conquered a larger field of 7,319 players in 2010, but won just $8,944,138. Jonathan Duhamel was the first Canadian to win the World Series of Poker Main Event, storming through a field of 7,319 players to win the title. While he hasn’t won too many tournaments since, he did make headlines after he was robbed of cash and his WSOP. ring back home in Quebec. 2006 was a special year for the WSOP. Because so many people chose to play online poker, and because pretty much every site was giving away Main Event packages to the WSOP, the field size grew beyond belief to 8,773 players, the biggest in WSOP history. Just a year before when Joe Hachem won the title, the field was 5,619. Conquering a field of 839 might not seem that epic, but 2003 was a huge deal for people who play online poker today. That was the year that Chris Moneymaker (his real name) won a WSOP playing online poker and won the WSOP Main Event. His win put a huge spotlight on the online poker world. The following year, the Main Event field jumped to 2,576. Johnny Moss won the first WSOP, but he didn’t bluff his way to a big win. The first WSOP was decided by a vote of his poker-playing peers. Instead of a bracelet, he walked away with a silver cup. These are just five of some of the most memorable WSOP winners in history, but there are lots more legends who have taken a seat and made history, including Phil Hellmuth, who has more WSOP bracelets than any other poker pro with an impressive 13, including a Main Event bracelet in the 1989 World Series of Poker and a win in the 2012 World Series of Poker Europe Main Event. So where did the other 11 bracelets come from? Well, the World Series of Poker is home to more than just the Main Event. There are dozens and dozens of tournaments to play in each year over the span of two months. Some require much smaller buy-ins than the $10k need for the Main Event. And others cost even more, like the $111k buy-in event for One Drop. If you want a shot at winning a bracelet and making next year’s big list of recent winners, check out some of the poker sign up bonuses we list here, play online epoker, and win your way to the WSOP now.